HPS' goals are to enhance the knowledge of our rich history by presenting programs and lectures that provide a link to the past and illustrate the contributions of Hellenism in Western Civilization. Through our collection and archival materials current and future generations are exposed to the objects that reflect the culture and history of the Greek immigrants and their ancestors. The mission of the Hellenic Preservation Society is to present a unified voice of the Hellenes in Northeastern Ohio that will promote the Greek experience through programs, collections and preservation. Mission / Description: The Panepirotic Federation of America was founded in Worcester in 1942 by Greek immigrants from that region. It was created to improve the economic situation and quality of life of the people living in Epirus as well as to protect the human rights of ethnic Greeks living in Southern Albania. Pavlos Gyparis (Greek: Παύλος Γύπαρης, 1882 — 22 July 1966) was a Greek Army officer famous as the commander of the personal guard of Prime Minister Eleftherios Venizelos. He took part in many conflicts, and in 1920 was implicated in the assassination of Ion Dragoumis, a political opponent of Venizelos. CHICAGO- Anton Christoforidis is one of the most successful professional boxers of all time. Winner of multiple middleweight and light-heavyweight titles in Europe, North Africa, and the United States, Christoforidis has long been recognized as the first Modern Greek to become a world class boxing champion. Yet such acclaim did not come easily or without considerable and sustained effort. 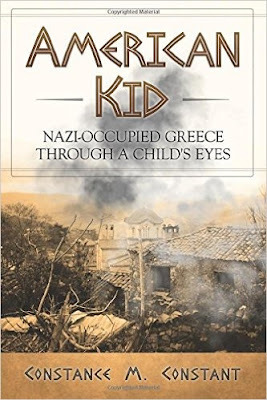 American Kid: Nazi-Occupied Greece through a Child’s Eyes reveals the despair and agonies that befell civilians during the Nazi occupation of Greece. Author Constance M. Constant digs deeply into an era that few people now remember, along with the horrors of bombings, ruthless killings of innocent people, and starvation that defiled bucolic Greek villages. You will be able to do a book search through their online CPLS Catalogue. The Central Public Library of Sparta was founded in 1972. It is a public entity and belongs to the group of public libraries, which are supervised by the Ministry of National Libraries Section and Education. The library, since 1989, housed in a private building in which the departments have grown to usable area 1500 sq. meters. On the ground floor there is a multipurpose hall of 230 seats, the use of which has been allocated at the Cultural Center of the Municipality of Sparta. The Argoliki Library of History and Culture, serves as a non-profit historic and cultural organization. The main purpose of the research, identification, collection, classification, preservation, study and publication of archival material concerning the historical and spiritual evolution and development of the Argolis prefecture of the Peloponnese and generally in Greece. Through the recording and promotion of this material aims to make partakers all those interested to learn, to study or to make this cultural and historical treasure. The above link is to the portal for digital collections of the Academy of Athens. The general and overarching objective of the Academy of Athens, in accordance with its Founding Charter, is the cultivation and advancement of the Sciences, Humanities and Fine Arts, along with the communication of the Foundation and its Members with other Academies and fellow Academicians. In fulfillment of its objective the Academy conducts scientific research projects and studies in the areas of agriculture, industry, shipping, national economy. Furthermore it issues consultations, proposals, it adopts decisions and judgments for the instruction and guidance of the bodies and authorities of the state.